Visiting the Henry Ford Museum – Sports Cars, Tractors and Wienermobiles! If you have never been to the Henry Ford Museum in Dearborn Michigan, then you are missing a museum of tech history. More than just cars, Henry Ford was an avid historian. He loved to preserve the past so you could see it in the future. The Henry Ford Museum is also more than just cars. Furniture, tractors, generators – this is only the tip of the iceberg to this place. I had only two hours to look around this place, and I only saw one tenth of the museum. So I am going to show this in parts. Next time I am out there, I am going to make part 2, then part 3, and so on. The room of timepieces alone could take up 2 hours! We looked at a couple cars before I got into the aisle of sports cars. 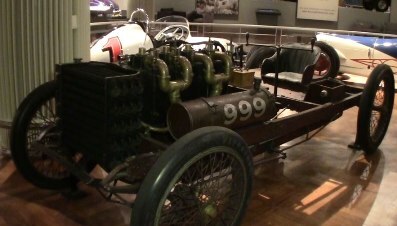 There, I saw the 1903 Packard Model F runabout (a cross-country vehicle), the 1902 Ford 999 Oval track, the 1965 Lotus Indy car, 1965 goldenrod that held the land speed record for 25 years at 409 MPH. Ford also has a display of generators at the museum. I walk through and see the Highland Park engineer generator of 1912. This generated 4,000 kW. I also look at the 1897 alternating current generator that supplied power to the bunker hill and Sullivan silver mine in Idaho. I look at the inside of a Turbine generator, a Marine steam engine from 1875, and the Edison GE company Dynamic that put out 200 kW. 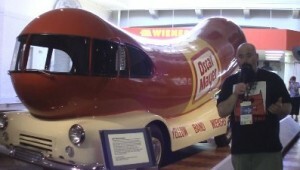 The first wienermobile came out in 1936, but this is the oldest known model around. This 1952 model was built by the Gerstenslager Company. They used a Dodge chassis for that model. Looking at the first Ford tractor, I would have hated to drive that around for 12-14 hours a day. But in retrospect, the alternate would have been much worse. I take a look at some of the farm implements that you would see at the Henry Ford Museum. In all, it was only a glimpse of what was in there. There was a lot more in the museum, including furniture of the centuries, timepieces, and parts of towns. I plan to be back there soon to record a lot more and get it out to you.